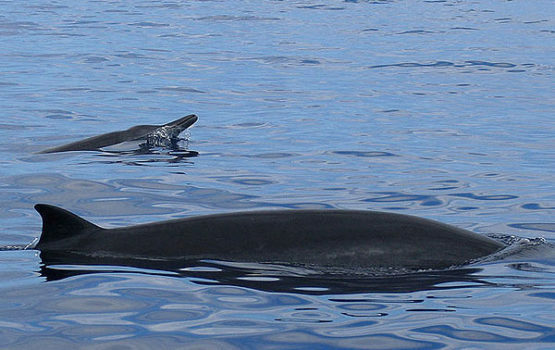 Lengths and weights of Sowerby’s beaked whales at birth are about 2.4m long and 170kg. The maximum record length for this species is 5.5m with 1300kg of weight. Life span is unavailable. 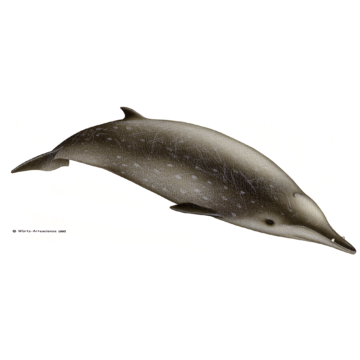 This species of beaked whales have similar fusiform bodies as the other mesoplodonts, with a moderately long beak and a small dorsal fin set about two-thirds of the way back from the snout tip. They often have a prominent protuberance on the forehead. The two teeth in the lower jaw of adult males erupt at a position about two-thirds of the way back from the beak tip. The teeth are visible outside the closed mouth, although they are not particularly large. The mouthline arches slightly. The long and thin grey beaked is often exposed at the start of a surfacing, and the erupted teeth of adult males may be easily seen. The colour pattern is also similar to other mesoplodonts, consisting of a dark grey dorsal surface and a lighter grey ventral side. There are also scars present on the body of adult individuals, especially males. 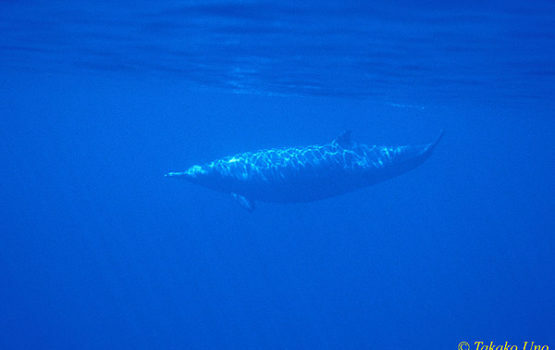 Squids are presumed to be important in the diet of Sowerby’s beaked whales, but fish otoliths have been found in stomach contents of stranded individuals. They can occur in groups of 8-10 closely associated individuals, including adult males and females with calves. This species distribution is limited to the North Atlantic and they occur in cool and warm temperate waters. Although a single individual has been found stranded in southern Brazil. 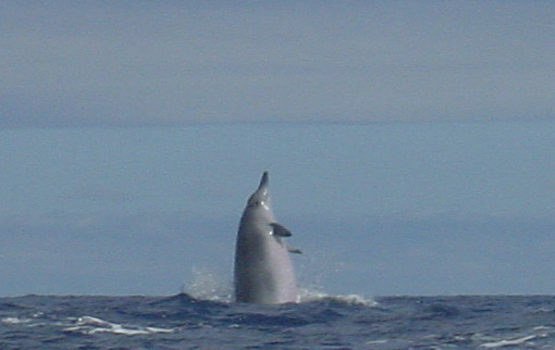 Although difficulties arise in the correct identification of mesoplodonts in an area where several similar species occur, Sowerby’s beaked whales usually surface exposing more the beak than Gervais’ (Mesoplodon europaeus), True’s (M. mirus) or Blainville’s beaked whales (M. densirostris). If adult males are spotted then the posteriorly set tusks differentiates them from the other species as well. Although it’s not easy to approach and see mesoplodonts, this is the most frequently sighted species of beaked whales in the south of Pico. We find them every year on several occasions throughout the season. 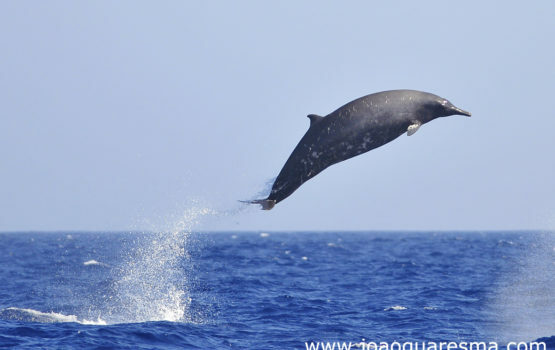 They have been observed from April to October, but there is a peak in the sightings in the summer months (June-September), although in early years when in doubt of the correct species, Espaço Talassa often identified beaked whale’s sightings as Mesoplodon bidens. Since 2014 we have corrected that mistake and when it is not possible to be certain of the species we identify them as Mesoplodon sp.